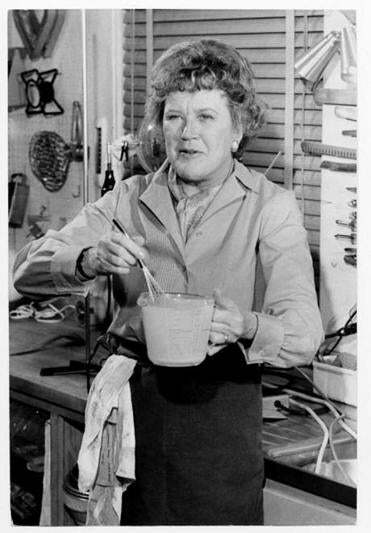 Young American chefs lucky enough to have been befriended by Julia Child back in the 1980s owe her a huge debt. Her enthusiastic love and support of a new wave of restaurants set the stage for what is arguably a food revolution still going on in the United States today. Her guidance and counsel, while always welcome, could also be a bit nerve-racking. In the early days at Hamersley’s Bistro, she would sometimes call the morning after a meal to make “suggestions.” You can bet I was taking notes during those conversations. Later, when I was a better cook, I was asked sometimes to help her out onstage during fund-raising demonstrations. One time, Julia thought it would be fun for me to accompany her to Boston University and help with a demonstration on how to make a French omelet. Making a good omelet isn’t hard, but with Julia peering down over my shoulder (she was an inch taller than me), I was sure that I’d mess things up. Her last words on the phone were: “Practice a bit, dearie, so it comes out of the pan just right!” I hadn’t made an omelet in 10 years. Yes! Practice. In the days before nonstick technology, we made omelets in carbon steel pans that had to be seasoned. The surface had to be conditioned just right so the eggs wouldn’t stick to the pan when you tried to roll the omelet out onto the plate. To reseason a carbon steel pan that has been neglected, sprinkle the inner surface with kosher salt and put it in a 350- degree oven for 45 minutes. The salt absorbs much of the old excess crud in the pan, and when you wipe out the salt, out comes said crud with it. With the pan now clean, rub the surface lightly with cooking oil, and return it to the oven for 30 minutes. Then wipe it out and repeat the oiling step. You have essentially resurfaced your pan, and you’re ready to cook. To be sure, nonstick pans have helped take the drama out of omelet cooking, and I subscribe to having a high-quality nonstick pan just dedicated to eggs. Omelets come in many shapes and sizes, and most cultures have their variations. Super-thin ones are made in American diners, cooked on the flat griddle and folded. There are Chinese omelets, egg foo yung, made with pork, shrimp, and sprouts. There are omelets cooked in India made with cumin, coriander, and chiles. But Julia’s simple, fluffy, rolled French omelet — with just a little optional filling — remains the standard by which I measure all others. I like to make omelets for a light lunch or dinner, so I do make some filling. For this spring variation, start by cooking potatoes, asparagus, and morels. Then add tarragon and scallion and reserve the mixture in the pan to keep warm. Next beat the eggs with a few drops of water or milk. This will make the eggs nice and fluffy. In your nonstick pan, cook the eggs quickly in butter. Many recipes call for letting the eggs set, only pulling them a bit from top to bottom and side to side to ensure even cooking. While this works, after many years of cooking omelets at brunch, I find that if you stir the eggs rapidly with a rubber spatula until they are barely set, this produces a perfectly shaped rolled omelet with a very light, golden outer surface. When you’re ready to finish, spoon the vegetables into the center of the eggs and sprinkle with Parmesan cheese, and you’re ready to turn the omelet out onto the serving plate. Then there is the wrist-tapping technique most French chefs use to start the process. That night at BU I was a nervous wreck. Did they have a nonstick pan handy? Not that I could find. I seasoned the pan in the kitchen that seemed most likely to give me success, and as Julia spoke about Napoleon and the legend of how he first discovered the joys of omelet eating, and while the audience listened and laughed, because Julia was on her best game that night, I gave it my all to make one perfect omelet. When the eggs were just barely set, Julia said, “Now Gordon will turn the omelet out onto the plate!” I tapped the wrist of the hand I held the pan with. This made the outer edge of the eggs jump up and land evenly on the center. Then I carefully used my spatula to fold over the inner edge. I repositioned my grip on the pan so I could lift my arm high enough to tip the pan, and out rolled the omelet onto the plate. Julia beamed, the audience roared, and I raised my hands in victory. See? Easy.